What do you think about when you see the word ‘Pearson’ written in white text on the dark blue background? Do you think of a textbook or a digital learning application? For me, Pearson means so much more. It’s more than just a company, it’s full of life changing experiences. I have been a Pearson Campus Ambassador for about three years and have had very memorable stories I would like to share with you. 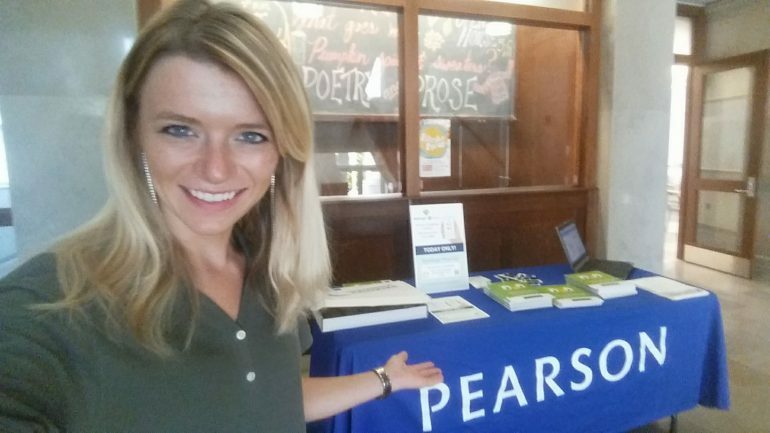 Pearson employs a student Campus Ambassador at over 50 campuses across the country. Up until last summer, I hadn’t met a single one of my colleagues in person. However that did not stop wonderful friendships from blooming. I feel like each one of the other Campus Ambassadors is my friend, and it’s a privilege to work alongside such dedicated students who care about education as much as I do. However, the Pearson community extends way past the Ambassador program. Down to earth is usually not how you would expect to describe executives of an international corporation. However, representing the student voice on a Global Call hosted by John Fallon (Pearson’s CEO!) I was surprised to see how nice he was. I had the privilege of meeting some of the VP’s of Pearson at a national meeting in San Diego this past summer, and witnessed them reaching out to students to get our unique perspective and insights. They truly care about the students. Jessica participated in Pearson’s Read for the Record. Read for the Record is one of the neat company initiatives Pearson supports. 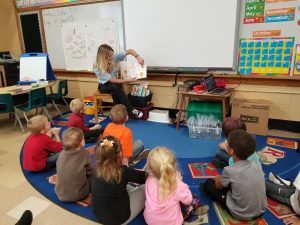 This year I was able to read Quakers to students at a Title I school in my town. This was a very inspiring and eye-opening experience, that I would not have been able to partake in if I was not involved with the Pearson Campus Ambassador program. Professional skills were refined as I upheld my responsibilities as an Ambassador. For someone who used to be afraid of public speaking, I can now confidently give presentations to an audience of hundreds! As the Student Editor-in-Chief of the Pearson Students blog, I am enthusiastic about writing and sharing people’s unique stories. I continue to earn more skills through the program, not only through the neat badging program, but also through the process of problem-solving as I interact with students regarding their Pearson products. The Pearson Campus Ambassador program is unlike any other job you could have on campus! You not only get to network with dedicated students nationwide, but you also become a part of a family of driven individuals who treat you with respect – regardless of their title. You will have the opportunity to take part in amazing company initiatives, and refine the skills you need to succeed professionally. I encourage you to see if the Pearson Campus Ambassador program is looking for a new ambassador at your school and apply here. 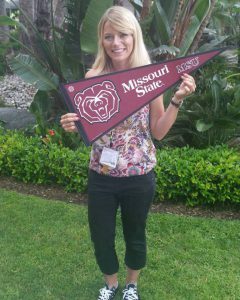 Jessica Albright completed her bachelor’s degree in Marketing at Missouri State University in May 2017, and jumped right into the Accelerated Masters of Business program at MSU, where she is currently working towards her MBA with an emphasis in Data Analytics. In her free time, she enjoys spending time with family and being outdoors. She is a huge animal lover, and founded her school’s first Animal Rights Club, which she currently leads. She enjoys being a Pearson Campus Ambassador, and the Student Editor-in-Chief for the Pearson Students Blog. Jessica is a Pearson Student Insider. To learn more about the program and apply, click here.